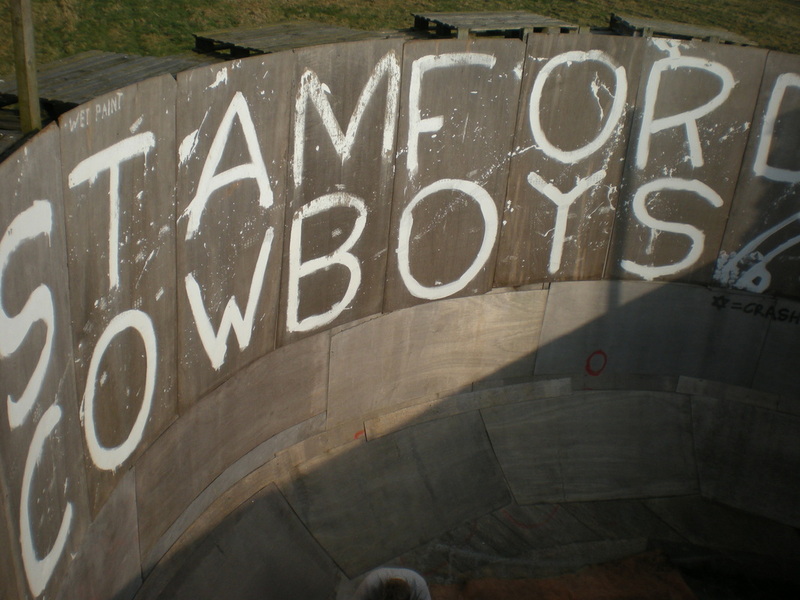 THEY SAID 'YOU WILL NEVER DO IT"
Ok i'll start at the beginning , The events that took place before sparked the thought process of that led to us sat in the Green Man bar stamford and saying 'WE SHOULD BUILD A WALL OF DEATH' and thinking what a great idea. 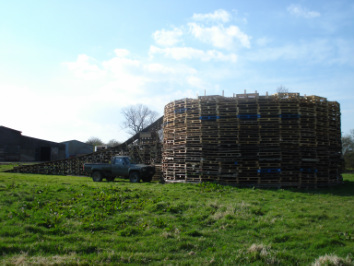 That event was the record attempt for the worlds biggest bonfire and the fact i had around 200 pallets left over (see bonfire video page for reason) and burning them just seemed pointless so a better solution was to use them more constructively. The WALL was born, the only research we did was finding out the internal diameter of your standard wall if there was a standard size and that turned out to be 30ft. So on January the 2nd 2007 we hammered a post in the ground and marked out our inner circle and just started laying down pallets . In a word yes this was simple, it took 17 pallets to complete one revolution and we just nail gunned them together , the most tricky bit was that the pallets were not all the same size and thickness and the bit of field we were on was not completely level so every few layers we had to pack some pallets up or swop them for different size ones to get it back on corse haha. To help out with lining the inside we broke up some pallets and nailed the planks at 2ft centre so we would stand some chance of finding a fixing point when covering with ply. At full height the wall stands 16-17ft (its taller one side as field not level) and took a total of around 850 pallets and the top half is much better built n stronger than the bottom because after building the first bit when i went to get more pallets i got them all the same size haha. The one question i'd be asking now after seeing all that ply is 'HOW MUCH DID THIS ALL COST" well i was lucky in when i was trying to blag a haulage firm to pick up pallets for my fire they said they had no spare lorries but had just refurbed a ware house n had loads of scrap wood to get rid of so expecting a lorry full of rubbish they turn up with what must have been a 1000 sheets of 6mm ply Quiet a lot of the sheets were split n half missing but there was plenty that were fine and my first thought was "WE ARE NOT BURNING THAT"so thats were all the ply came from which had it not i would not have been able to afford to do this as we put 3 layers on in the end .The curve at the bottom was at start a curve but the wood just wasn't strong enough to take the weight of the bike at speed and you can hear it on the crashing video snapping as i ride round "NICE" so a more simple 45* bank was what remained. 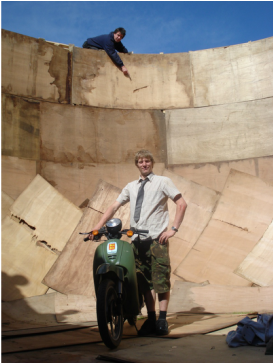 YES YES YES a moped believe it or not is perfect as there are no gears to worry about and as all the engine and drive is low down and around the wheel it has a low centre of gravity which is what you need . When riding the wall your not at a perfect 90* to the side your slightly more upright and a high bike like a motocrosser would want to fold back to the wall more. The speed you need to reach is probably around 25mph i tried to look at speedo while riding but that nearly ended badly as you can imagine our wall was not that smooth and just staying on the bike took all my concentration i couldn't even string sentences together as when i tried to talk to the camera while riding all i could say was "YEAH" which is on the final video at bottom.Learning to ride the wall of death was bizarre , when i explain the feeling i say its the closest thing to committing suicide as as you ride up but force yourself to not ride down which goes against what your logical mind is telling you. My first few goes ended up with a bent bike but had i have stopped and looked at footage i would have seen i had ridden in the vertical and therefore done it but was obsessed with getting to the top. On my second visit a nutty photographer called james came up with me n having someone else there who wanted to ride it was good as we pushed each other on and it was on that day i rode it properly as in sitting on bike and just going straight up with very little run up and doing several laps. The main thing then i had to deal with was sickness if you looked direct in front of you its just info overload and to far ahead you get very dizzy and disorientated so somewhere in the middle was about right and i think about 2-3 meters ahead. Thanks to all that helped as i did not build this on my own. It also helped rick get away from his failing marriage.